Welcome to the Pueblo Grande Museum blog brought to you by the Pueblo Grande Museum Auxiliary. I’m Roger Lidman, and I have the honor of being the museum’s director. I’d like to invite you to visit the museum for the first time, or as a return visitor. Pueblo Grande Museum has been serving guests since October of 1929 by sharing the story of the first people to live in the Salt River Valley, the Hohokam. We collect, preserve, research, interpret, and exhibit cultural materials from the site of Pueblo Grande and the Greater Southwest. We strive to enhance our guests’ knowledge of prehistory, history, and the ethnology of inhabitants of the Southwest, and promote a greater understanding of the diversity of cultures past and present. 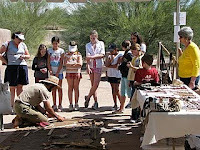 We have a variety of exhibits, including more than one-mile of interpretive trail, reconstructed houses, a demonstration garden, and the archaeological platform mound that was built by the Hohokam around AD 1150. We also have programs and workshops that explore a variety of topics and subjects. Our special events are a great way to get to know Pueblo Grande Museum while learning more about the prehistoric people who once lived here and how their legacy continues. Please join us for one or all of our annual events, which include our Native Foods and Craft Fair, Veterans Day Gourd Dance and Community Potluck, Navajo Rug and Art Auction, Pueblo Grande Indian Market, and Ancient Technology Day. Thanks for listening to my food for thought, please come in and get a real taste of what we have to offer.